Lina Medina (born September 27, 1933 in Paurange, Peru) gave birth at the age of 5 years, 7 months and 21 days and is the youngest confirmed mother in medical history. This world record is closely followed by a similar case in Russia. Lina was brought to a hospital by her parents at the age of 5 years because of increasing abdominal size. She was originally thought to have had a tumor, but her doctors determined she was in the seventh month of pregnancy. There was never evidence that Lina Medina's pregnancy occurred in any but the usual way, but she never revealed the father of the child, nor the circumstances of her impregnation. She refuses interviews. i posted a picture of the five year old girl Lina Medina and some more information. A medical history revealed that she had been having regular periods since age 3, but that she had stopped menstruating for the past 7? months. Additionally, she had fully developed breasts. 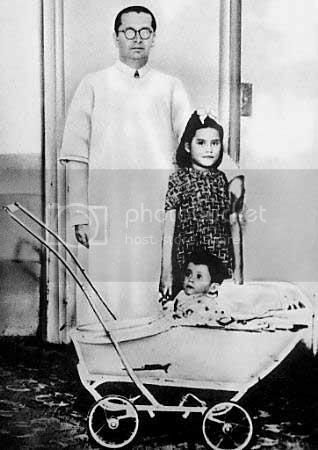 Jose Sandoval, an obstetrician who took an interest in Lina Medina's case and authored a book about her in 2002 said that Lina was a psychologically normal child, that she displayed no other unusual medical symptoms, and that she preferred playing with dolls rather than her own child. Lina's boy, named Gerardo (after Dr. Gérado Lozada, chief physician of the hospital in Pisco where Lina's pregnancy was diagnosed), did not learn until he was 10 years old that the woman he thought to be his sister was in fact his mother. Gerardo died in 1979, but Lina's second son, born in 1972 (thirty-three years after his brother), now lives in Mexico. Lina and her husband currently reside in the "Little Chicago" district of Lima, Peru. Woah. How the hell did she get that kid? that's just sick and show's why the world is evil! i think the word your looking for is disturbing ? she had abnormal/ early hormone surge..
those bastards!!!!! i hope they all die!! !